Supplement your keywords from the Word Depot with new words or interesting affixes to create original and unique names. Ideal if you have one main topic you want to convey. The Supplementer allows you to create names which contain your most relevant keyword and transforms them into real names. They still carry a certain meaning, but they are also unique and indistinguishable. With the help of the Supplementer tool, the term flowers for example is transformed into a strong "Flower Hero" or the feminine "Flowerina". The words and syllables are not only appended to the original keyword, but the sound structure is also altered in a way that the result is as melodic as possible. Test the Supplementer tool now - for free! Give NameRobot's Supplementer a try and test it for free. You can perform up to five checks with the tool to see how it works. 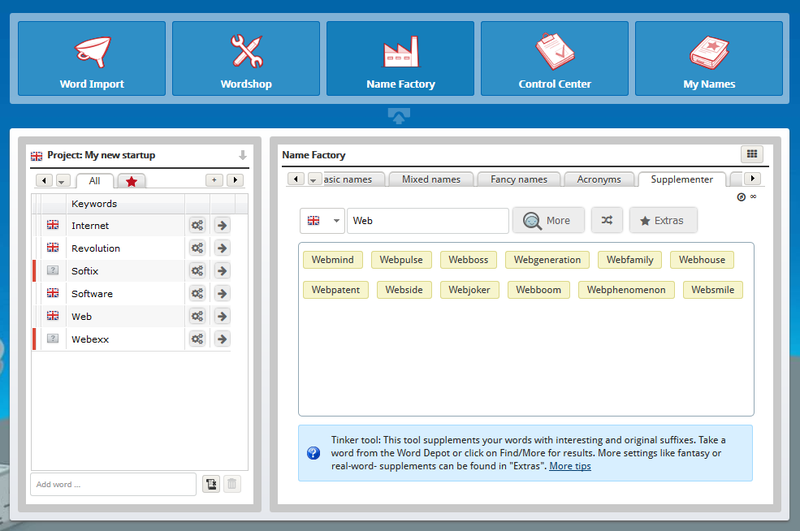 Enter a single word and create new names with interesting suffixes with just one click. In the screenshot, the setting "Fantasy endings" was chosen. You can also set the Supplementer to use English or German nouns as suffixes. Go to the Supplementer tool in the Name Factory right now to test it out! If you don't have a NameRobot account yet, simply register and start looking for a name!